Last time we looked at VO2 and SmO2 response to hard-start continuous power VO2max intervals. This time I want to look at my other favourite VO2max workout, the Rønnestad/Tabata style Hard-start 30/15s VO2max workout. This was the protocol I arrived at based on Rønnestad, Seiler, Buchheit & Laursen, and others’ research into optimizing interval prescription for maximizing adaptations to VO2max. It seems from the literature that accumulating more time around 90% VO2max is a ‘sweet spot’ for eliciting adaptations to VO2max. Intermittent/microburst style intervals can allow greater total accumulated duration at a target intensity, than continuous intervals would allow. Hard-start intervals stimulate faster VO2 onset kinetics to reach higher VO2 more rapidly. VO2 slow component, which is the drift toward VO2max at constant workload above CP or FTP, would usually result in premature exhaustion. But by decreasing power to account for this loss of efficiency due to fatigue, relative intensity as a percentage of VO2max (ie. 90%) can be preserved for longer duration. When I first received the VO2 Master Pro the first question I wanted to investigate was how well 90% HRmax correlated to 90% VO2max. As we looked at for the continuous VO2max intervals, the correlation seemed to be good for myself and the other athlete I measured. We both seemed to reach 90% for both metrics at around the same time, although my HR slightly under-predicted my VO2max (I reached 90% VO2max at slightly lower than 90% HRmax) while the other athlete’s HR slightly over-predicted their VO2max (they reached 90% VO2max at slightly higher than 90% HRmax). Compare the VO2 (blue area) to HR (red line) and where both are highlighted above 90%, respectively. On both intervals VO2 rapidly reaches target 90% within the first few hard-start 30sec microburst intervals, while HR rises much more slowly after reaching an initial plateau. The timing of onset of 90% HRmax and VO2max were clearly very different, but if we look at the time accumulation above both targets, we see ~11min at >90%HRmax and ~9min at >90%VO2max. Fairly close, but this might simply be incidental. VO2 kinetics appears to respond faster than HR. So while the micro-rests allow VO2 to briefly dip below the strict 90% target on each micro-rest, HR shows a slower, but more stable rise toward 90%. Compared to this, a continuous power interval provides a more stable demand/stimulus to allow both HR & VO2 to remain more consistently elevated above 90%. It could be possible to simply tweak the parameters of the microburst workout to have either higher workload, or shorter rests, or some combination to prevent VO2 from declining below our 90% target. But at least for me, I was already maxing out RPE on these workouts… I’m not sure I’d be able to finish the sets if power was much higher! VO2 onset kinetics rises rapidly to 90% VO2max within roughly 90sec. HR kinetics also rises rapidly to 90% HRmax around 90sec. VO2 & HR both remain consistently elevated above 90% for the full remaining duration of the interval. VO2 onset rises rapidly again, reaching 90% VO2max within roughly the same 90sec. VO2 is more sensitive to changes in workload between work & rest, falling under 90% during micro-rests and rising again above 90% during work intervals. HR rise is slower and can be disrupted by the first micro-rest, causing HR to initially plateau lower than 90%. HR is subsequently more stable than VO2, meaning once it’s above 90% HRmax it usually remains above that level. It appears that the correlation between 90% HRmax and 90% VO2max holds more accurate for continuous power intervals, than for intermittent microburst intervals. More precise prescription of work & rest intensity & duration could mitigate this variability in VO2 and delayed rise in HR. Another good example of HR-VO2 relationship is demonstrated in another workout I did a few weeks later. I was over fatigued for this workout, and as we’ll see I had difficulty reaching the same output as the workout above. I started with a 6min continuous VO2max interval and actually felt good until around half way through. Then my Wahoo Kickr trainer hit a power spike, which is when the smart trainer suddenly and sharply raises resistance on the flywheel. If you’ve ever felt it before, it’s like running into a brick wall.. It was very tough to pedal through and kinda knocked me off my game for the rest of the workout. The 6min continuous interval shows better correlation between onset of 90% HRmax and 90% VO2max, and accumulation of time >90% (3:58 for HR, 4:08 for VO2). But after that even with 15min full recovery, I felt like my legs weren’t coming back.. So with trepidation I hit the hard-start 30/15 microburst set. After the first few 30sec microbursts, it was obvious that VO2 wasn’t responding as normal. I was stuck below my target of 90% VO2max despite the workload being on target, and RPE was significantly higher. I felt like I couldn’t stay on top of the gear. I must have been digging deeper into my anaerobic energy reserves, because I just wasn’t able to utilize the same volume of Oxygen for the same effort as during the previous workout. I had to skip an interval and my already depressed aerobic system dropped precipitously in those 30sec of backpedaling. HR fell from 177 to 152 bpm, and VO2 dropped all the way to 2400 mL/min from my target of 5000 mL/min. I was able to continue by lowering the intensity, but VO2 never reached the 90% target through the entire set. Fatigue can contribute to depressed stimulation of the aerobic system. Delaying or preventing entirely the attainment of 90% VO2max. My guess is that the blunted aerobic response forces greater reliance on anaerobic metabolism to meet the required workload, meaning faster accumulation of fatigue-causing metabolic byproducts, higher perceived effort, and premature exhaustion. This illustrates the importance of ensuring you are fresh and rested for your high intensity interval workouts. And also identifies a potential explanation for the phenomena of ‘non-responders’ to VO2max training when only HR is used as a corollary for VO2. The final 30/15 workout I want to look at shows a couple of interesting things. First, another example of different timing of 90% HRmax & 90% VO2max onset, and more interestingly second, an example of manipulating breathing to stimulate greater VO2. The first set shows the typical rapid VO2 response to 90% VO2max within ~90 seconds, but this time HR was much slower to rise, only reaching 90% HRmax in the final few minutes. The time accumulation during the first set were 8:19 at >90% VO2max, and only 1:38 at >90% HRmax. I was feeling good during this workout, and I suspect the lower HR for higher VO2 actually reflected greater fitness or freshness on that particular day. My body was able to deliver and utilize more oxygen with relatively less effort (or at least fewer pumps) by my cardiovascular system. Then something interesting happened during the second set. For some reason, despite HR rising higher than in the first set, I noticed VO2 was sitting lower than my 90% target. I also noticed that I wasn’t breathing as fully as in the previous set. I was beginning to breathe with shorter, shallow breaths which are less efficient at allowing oxygen exchange at the lungs. I’ll talk more at some point soon about what I’m currently learning about pulmonary limitation to VO2 and respiratory training, but suffice to say that I suspected my respiration was beginning to limit my oxygen uptake in real time. I tried to refocus on taking deep, full breaths. Sure enough tidal volume re-normalized from as low as 4.0 L to above 5.0 L per breath, and VO2 rose back above 90% for the end of the set. My hope is that this rise in VO2 allowed my working muscles to produce just a little bit more work to finish off the microburst set. RPE was certainly higher before I refocused on my breathing. Alternatively VO2 could have risen in response to my respiratory muscles having to work harder to push those deeper breaths. In either case by focusing on maintaining tidal volume per breath I created a greater energy demand and stimulated my system to consume, deliver, and process more oxygen to meet that demand. I think regardless of where that oxygen was going, it was an effective training stimulus for increasing systemic VO2max. This workout was an example of how poorly HR can be correlated to VO2. I spent more time >90% VO2max and less time >90% HRmax during the first set, but the reverse during the second set. While it equaled over the course of the workout, it supports the findings that HR is a worse predictor of VO2 for intermittent microburst intervals, compared to traditional continuous power intervals. Likewise, while power was very similar across these Hard-start 30/15 workouts, my VO2 response varied from day to day. It seems to me that a better estimate of VO2 should include all three measurable metrics: Power, HR, and RPE. VO2 uptake can change with different ventilation strategies. 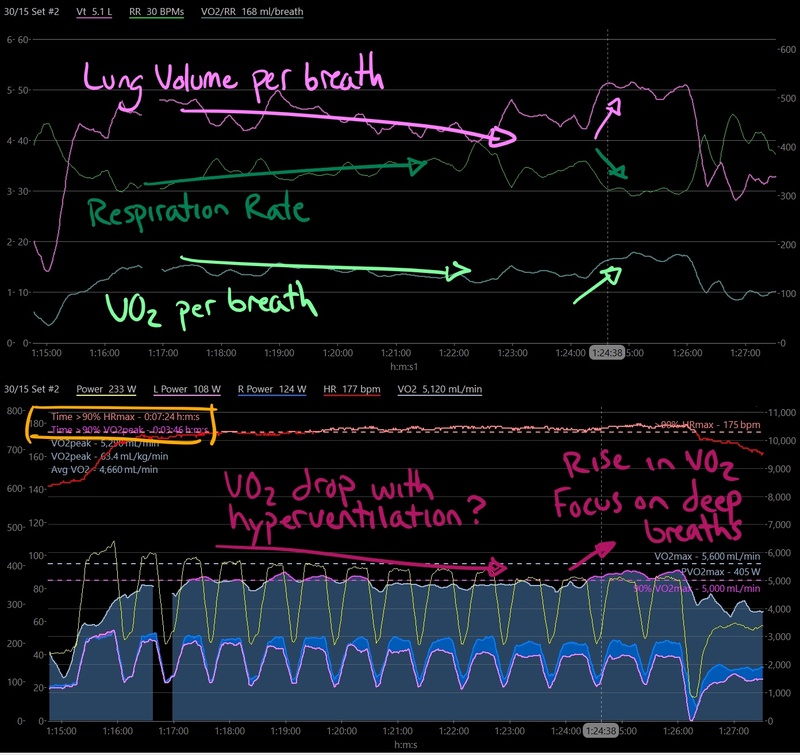 Typically higher Vt (tidal volume per breath) is more efficient than higher RR (respiration rate) because of the pulmonary dead space on each breath. Deeper breathing allows greater available surface area for gas exchange at the lungs. Focusing on deeper breathing may increase systemic VO2 either from increasing delivery of oxygen to the working muscles (your legs!) and/or to satisfy an increased work of breathing by the respiratory muscles… Or possibly for some other reason entirely? I still have a lot of learning to do regarding pulmonary affect on oxygen consumption and respiratory training, but the more I read and experiment, the more I see the potential for improvement. If there is a conclusion here, I believe it is that without precise measurement of VO2 the best bet on optimizing your own VO2max workouts day-to-day is to account for power, heart rate, and RPE (rating of perceived exertion) together. No one metric alone can accurately predict VO2. I haven’t talked enough about RPE, but your brain is probably the best tool to estimate how close you are to ‘maximal effort’. If power is barely sustainable for a 3-8min interval, HR reaches near HRmax, and RPE is near 9/10, chances are you are close to VO2max!